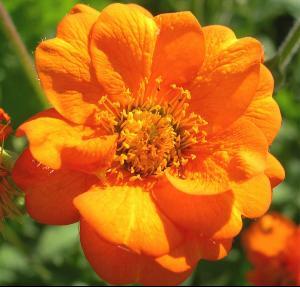 Geum 'Princes Juliana' (sometimes called by its more English name, Geum 'Princess Juliana') is an early-flowering Geum, producing warm orange flowers on tall stems above mounds of rounded foliage in late spring and early summer. Combines well with other later-flowering perennials such as Salvia to create a long season of interest for a planting scheme. Plant in full sun, in a moist, well-drained soil.